Rear wheel bearing with dual timken bearings. 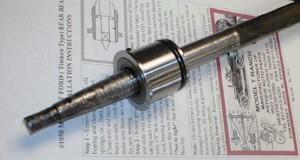 Rear wheel bearing cartridge with dual timken bearings and races. This bearing slips right into the axle housing. The bearing has a grease seal at each end and an O-ring to seal the body to the axle tube housing. This kit does one side of the car, two needed per car. With this Timken bearing, do I need to do any machining, or just insert and go? What is the difference between this item and 2508ORB? This beaing is made from two tapered timken bearings that come in a sleeve catridge. The 2508ORB is a needle bearing assemble.